I have yet to even consider tackling jeans…but on the pants that I’ve made I have to take a wedge from center front – pretty much the opposite of what you did to the back (I have to make the full booty adjustment too though!) 🙂 For me, it’s normally remove 1 1/2″ (3/4″ overlap) in front and add 1″ to the back. I have yet to adjust for my prominent thighs. I like to take the front wedge out through the zipper area; yes, it leaves me with insanely short zippers but I don’t have the front crotch bagginess anymore. good to know, it’s possible i’m over-thinking it! Gosh last time I sewed a pair of pants I was in grade 8. Yes THAT long ago. There were pink polyester and horrid, but I wore them anyway. I haven’t made a pair of pants or anything of the likes since. Maybe that should be one of my goals for 2014? Oh man, jeans are so scary! But these look great! I can’t believe they’re your first pair– they’re really pretty spot on! Crotch depth and whatnot just seems so mysterious and worriesome! i’ve only ever made the thurlows (which fit me great out of the envelope!) so it was a little scary trying a new pattern. glad i finally gave it a try! I think you are a couple of steps ahead of me in the jeans-sewing game! I made my first pair just recently (as yet unblogged) and I know I need to do some slight fitting adjustments in the crotch area (oh yes, please, let’s find another word for this!!!). The trouble is I have no idea which ones, but I think I might have prominent thighs as well, so I will google “flattening the front crotch curve” with interest. I like the way you adjusted the leg, by the way. That’s kinda what I am aiming for as well. i picked up some fitting ideas from Sarah Veblen’s “complete photo guide to perfect fitting.” there’s a couple pages at the very end that address the shape of the crotch curve, so that book might be helpful to you also! These look really good! I can’t help with the fit issues – I just make it up as I go along, tucking and slashing and whatever until I end up with something decent. I can’t wait to see your next pair! These are an awesome first pair of jeans! I have made 3 pairs also using Jalie 2908, and have vowed not to put the waistband on the bias-it stretches out too much! I have a similar shape to you: pear with prominent thighs and I also get that weird fold in my RTW jeans. I made the higher waisted version of the Jalie so they don’t slip down at all and that fold is minimal. I will be curious to follow your jean making quest and progress! i do think the poorly fitting waistband contributes to the problem since the pants just can’t anchor on the body. after taking pics i put a belt on and that improved things a tad. Those jeans are really good for a first run through! If you figure out the below-fly-fold thing, please please pretty please post about it. Any time I try to buy RTW pants for work they always have that crazy flap-bag to an extreme degree. I’d love to know how to fix it. i’ll definitely document my changes! I want to jump on the printed skinny jeans bandwagon so badly but because I have a 35″ inseam it’s more like the printed capri bandwagon. I am scared to death to try sewing fitted pants since all of the patterns I see on burdastyle end up skinny on bottom but floofy on top. Floofy is the technical term. Thanks for this — I can relate! i so badly want to make some printed denim jeans! i’ve been crushing on that trend for a while. Your front crotch is too long. 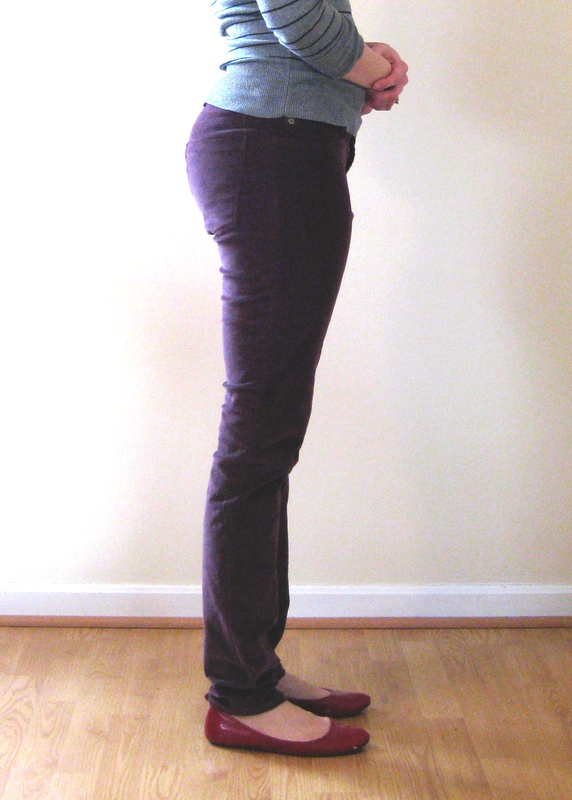 If the RTW jeans don’t have the extra fabric, why not compare the length of the RTW front with the Jalie? 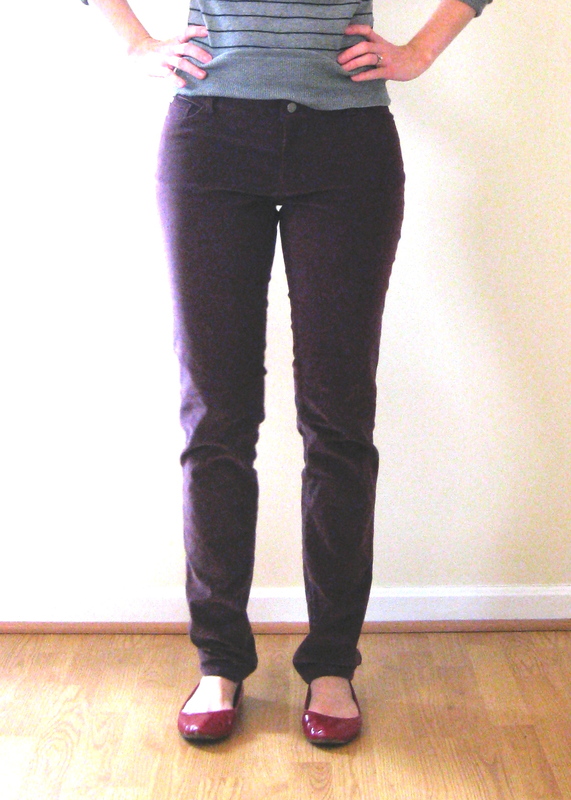 I have to shorten the front on pants by about 1″, and length (or do an FBA). I have the wrinkling on the back legs, too, but haven’t quite figured out how to solve it. These look AMAZE for the first go! Congrats! thanks! i did compare the front rise and the jalie was a tad longer, but the rise on my comparison jeans is lower than i was going for. i suspect that my pelvis tilts back more than the jalie accounts for. at any rate, can’t wait to get another pair made! If I made pants that looked this good I’d be jumping for joy! I’m very interested in your fit changes since my lower half is similar to yours. Cation Designs did some pants fitting posts. This one mentions bagginess in the front crotch (sorry) in one of her bullet points. http://cationdesigns.blogspot.com/2013/11/lessons-ive-learned-regarding-pants.html. yeah, i am pretty happy with them as is, and i’ll definitely wear them. i do mean to re-read her posts before i start tweaking! The pants are looking great! 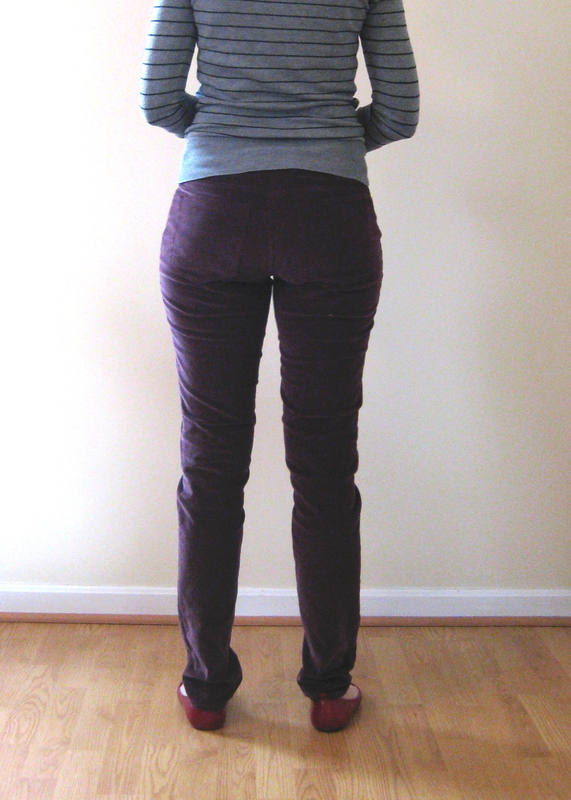 To fix some of the back wrinkles, try adding a bit to outer seam at the upper thigh level. See how the wrinkles slant up to the outer seam? They are trying to grab some room. 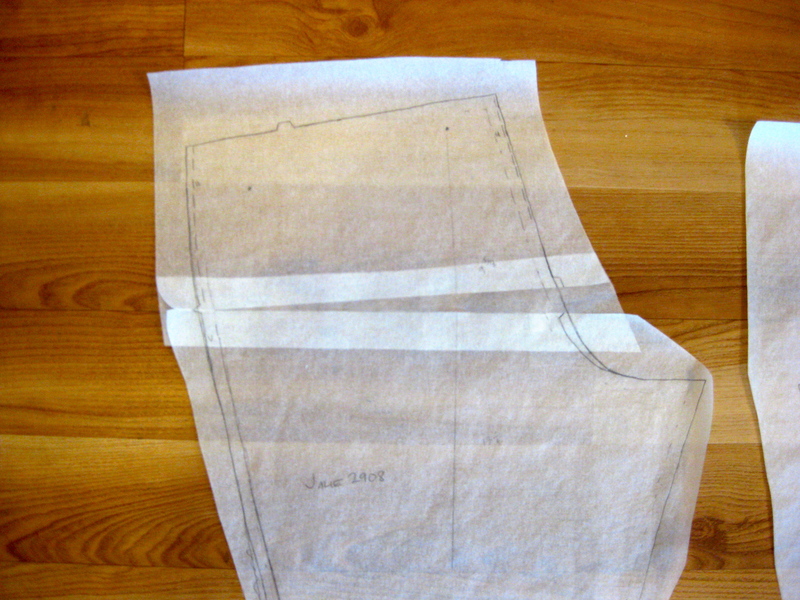 Add a wedge to the outer seam and remove from the hem to keep the lenght correct. I would start with 1/4″. And what a quest that is! Looks like you’re off to a great start. I plan to join you in the quest later in the year. Yay, jeans! I think yours look great – the leg shape looks especially nice. After my pleated pantscapades, my sights are set on making a pair of skinny jeans – very similar to what you made. Those pleated pants did take the better part of a year to get under control so who knows how jeans will go! I’m tempted to just take the pleats out and use the same (ugh, sorry!) crotch curve. And, I’m pretty nervous about trying rivets and jeans buttons! It is a journey indeed. I think they look fantastic. And I bet in real life, you’re very rarely standing still, so no one is going to notice that little wedge 😉 Thanks for all the info – I don’t have jeans on my list yet, but may in the future, and if so I’m sure I’ll be referring back to this! you’re exactly right, and as long as i’m wearing a belt to anchor them (the waistband is totally worthless…) i feel no shame in wearing them out of the house. in fact they’re really comfy! i think using a non-traditional denim (corduroy or other stretch twill) makes for great baby steps before doing the real deal. The corduroy looks really awesome as pants. Can’t wait to see them in denim! I agree with you on the front crotch, but other than that these look awesome. I’m preparing to make jeans, but it will have to wait till I finish a couple projects. I took a few Craftsy classes I thought really good. Betzina has a pants fitting class that address all the issues you talk about. And Kenneth King addresses the waistband. He actually creates straight waistbands (on bias if I remember right) and irons the curve into it. I’m gonna try that one. thanks for all the helpful info, i’ll be checking out your blog for your future jeans! i should really bite the bullet and pay for some of the online courses, i’m sure they would come in handy! HAHAHA rofl at your fba comment – I hear that! These are a great wearable muslin! And I love corduroy skinnies! 🙂 Can’t wait to see how you progress! I am going to closely follow your adventures in jeans making. Hoping to try pants this year so I totally appreciate the detail you go into about fit. Love that “FBA” for the bottom part of the body and I suspect I’ll be needing that too. And hey, totally hear you about the word “crotch”! A noble quest! And one I’ve yet to embark on with any seriousness. Seems to me you’re doing pretty well, with really only that folding over of fabric at the front crotch, which I have no doubt you’ll be able to eliminate from your next pair! I find a slightly curved waistband to be ever so much more comfortable than a straight one… but it does become such a fabric hog that way. After making the one pair of jeans I have made – I was blown away by just how much the fabric affects the fit. AND then after a few wears I was being seriously judgemental about the fit, only to go back to my RTW jeans… and all of a sudden I was seeing fit issues I’d never even noticed before. Wierd how it’s so easy to be critical of the thing I’ve produced yet not even notice the same issue in an existing pair of pants! that is so true! the RTW gets a pass for it’s flaws, but our own makes… perfection only! i realized some cheap RTW tees i’ve been wearing have terribly floppy neckline bands that i never noticed until recently. that would never be okay for something i made! we all need to cut ourselves some slack. anyways, i’m pretty encouraged by the jeans progress… now i need to find fabric for round two! Looking forward to seeing how these come out! I have no pants-making experience and am kind of terrified of them, so I applaud you diving in and tackling fitting issues. Go Lisa! I admire you taking a leap with a new pattern, but I was not that brave – as a fellow Thurlow lover I wanted to let you know that I made a successful pair of skinny cords with the Thurlow pattern! I traced off the top of the Thurlow pieces, then laid out a pair of skinny jean capris that I love the leg fit on and traced them from the crotch down. And believe it or not it worked! 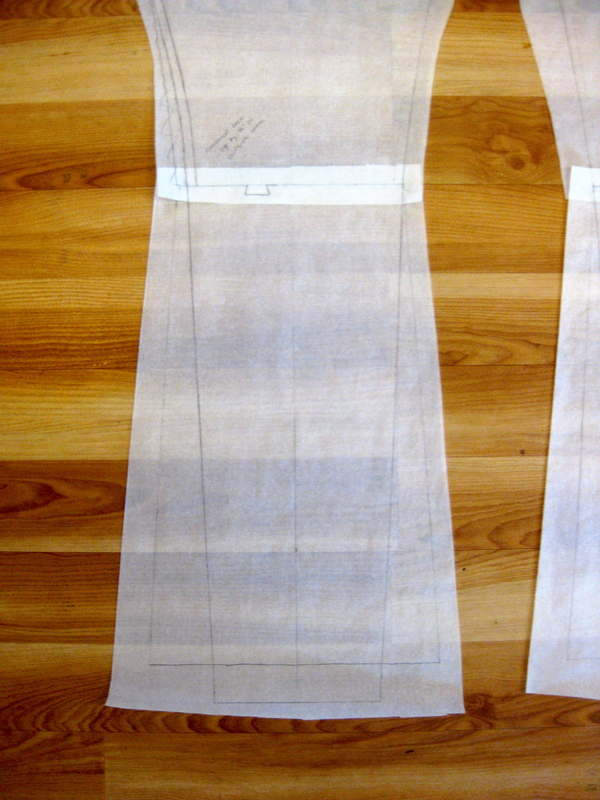 I imagine you could do the same now with the leg of this pattern and the crotch curve and waistband of the Thurlows. They’re not very jeans-like on the top, but for my next pair I’m thinking I’ll convert the back darts to a yoke and curve the pockets to a jean shape. Hey, I found a pant pattern that fits, I’m not going to start all over! that’s good to know! although, i think i had a similar crotch curve issue on the thurlow, it’s just less bothersome given that it is more trouser than jeans. i imagine a pattern alteration from dart to yoke will be a piece of cake. good luck! I am working on Jeans, too! Almost done with my first pair!! I toke Angela Wolf’s Jean class on Crafsty and found it to be incredibly helpful! 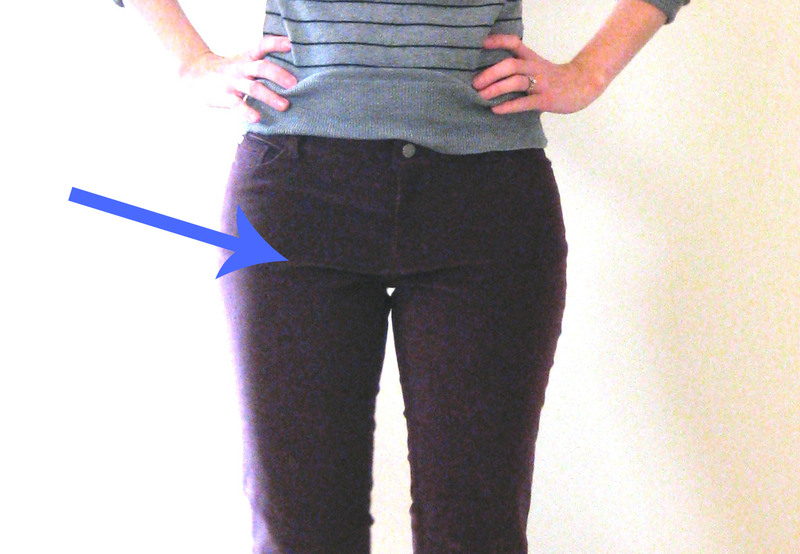 Both pairs of my RTW skinny cords do that same thing in the front, but I’ve never had it with any other pants. Could it be a fabric thing?